NAMM 2018: While some mobile audio interfaces are pretty simplistic affairs, CEntrance’s new MixerFace R4 looks like a serious piece of kit. About the size of a smartphone, this 4-input device features two Neutrik combo jacks with Jasmine mic pres and 48v phantom power. 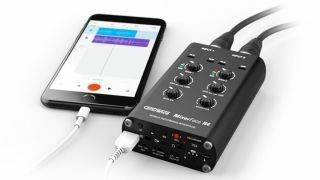 This enables mic, line, and instrument recording, with the option of a Hi-Z input for electric guitar or bass. Other features include a headphone amp and both balanced and unbalanced outputs. The rechargeable battery can last for up to eight hours, and you also get a low-cut filter, Aux input and a zero-latency monitoring blend control. Expected to ship in May, the MixerFace R4 will cost $299. You’ll also be able to buy it with a standalone stereo recording option for $349, and an optional X/Y stereo mic pair will be available for $49. The MixerFace R4 will make its debut at the NAMM Show, with further information on the CEntrance website expected to follow.